Advansta provides products for every step of protein analysis by Western blotting, from electrophoresis to immunodetection. 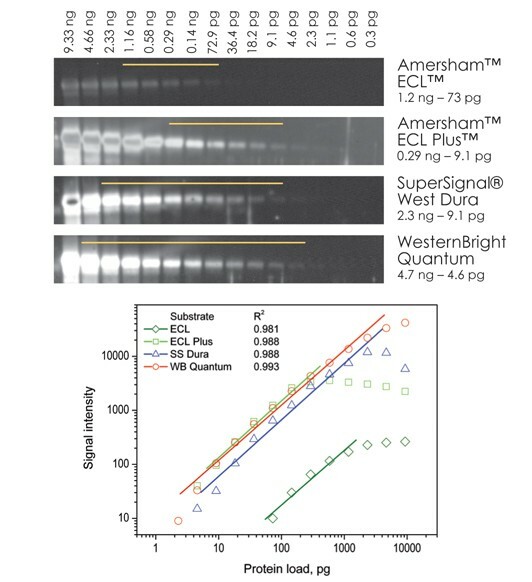 WesternBright ECL is more sensitive than other chemiluminescent substrates, so you can conduct shorter exposures, load less sample, or use up to ten-times less antibody. Save time and money with WesternBright ECL.
" ... I again later today tried the Quantum solution and it gave about 2 times better results than the one from xxxxx !" " ..we have now tested the new Advansta substrates extensively and my colleagues are also quite impressed and satisfied! " WesternBright Quantum is formulated to take full advantage of the linear dynamic range of CCD imagers. It provides high sensitivity to detect low abundance proteins, and does not exhibit substrate depletion with high abundance proteins, so has a larger linear dynamic range than other commercially available substrates. A signal linear with respect to protein concentration over 3 orders of magnitude provides the ability to accurately quantify and compare protein amounts in your samples. Sensitive – detect attomoles of protein per band. 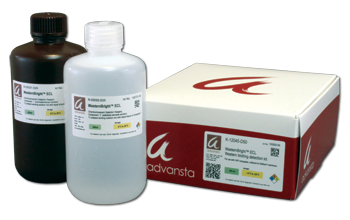 WesternBright Sirius is the most sensitive HRP substrate available from Advansta for chemiluminescent Western blotting. With attomolar sensitivity and a long-lasting signal, WesternBright Sirius allows you to detect bands not visualized with other substrates. High signal-to-noise and a large dynamic range make it ideal for quantifying low-intensity bands. And, chemifluorescence emission allows WesternBright Sirius to be imaged by fluorescence imagers in addition to traditional CCD imagers and film.